Metro is proposing to increase, or restructure, its $1.50 base transit fare to $1.75 later this year, with further increases planned in 2017 and 2020. Metro anticipates that this will increase its fare recovery – the percentage of operations costs that are paid for by fare revenues – from 25 percent to 33 percent. Metro foresees that this fare increase will “deflect” riders; a small percentage of people who currently take Metro will opt not to ride. Officially, Streetsblog Los Angeles neither supports nor opposes Metro’s proposed fare increase. We hold that robust transit service is needed, and that fares need to be affordable, and that those two important ends can be in conflict. When inflation drives operating costs up, at some point, it can make sense for agencies to increase what they charge for what they provide. Reasonable fare increases are generally preferable to significant service cuts. I am not going to wade into all the issues in the fare increase, but want to explore another revenue source that Metro doesn’t seem to be paying attention to: parking. Metro has large amounts of parking that it gives away for free. For more than 90% of the spaces it owns, Metro’s parking “fare recovery” is zero percent. Parking revenue isn’t likely to cover the entire operating deficit Metro is asserting, but it can amount to millions of dollars, enough to delay or soften fare increases. Charging for parking will also deflect a small number of the riders who drive (driver-riders are a small percentage of Metro’s overall ridership – fewer than 10 percent), but, if revenue is used to offset fare increases, parking charges should lessen overall deflection. In some cases, charging for parking and keeping transit fares reasonable could deflect some drivers out of their cars and on to buses, carpools, bikes, and walking. What’s wrong with free parking? Isn’t that good? I can’t explain all of Donald Shoup’s The High Cost of Free Parking. Suffice it to say that, generally, when an expensive, in-demand resource like parking is given away for free, it will run out and there won’t be enough to go around. Shoup generally recommends that public agencies raise (or lower) the price of parking, to manage availability – to make sure people who want to park can find open parking spaces. When free parking runs out, then people drive around “cruising” for spaces, which is generally bad for transit, bicycling, walking. Building and maintaining parking spaces isn’t free for Metro. If driver-riders (less than 10 percent of Metro’s ridership) are not paying for parking, then non-driving-riders are subsidizing drivers. One way to explain this is to look at overall fairness. Metro is a public agency tasked with providing transportation services. In providing a public good (transportation), Metro can and should choose to subsidize. In Metro’s user fee structures, the agency makes policy choices regarding what it subsidizes. Right now, Metro subsidizes 99+ percent of the cost of parking, but only roughly 75 percent of the cost of riding transit. Metro is proposing to continue to subsidize parking at 99+ percent, but to only subsidize transit at 67 percent. Metro is proposing that “fare recovery” for transit needs to go from 25 percent to 33 percent, but parking “fare recovery” can remain at zero percent indefinitely. Metro says that fares need to go up to cover operating expenses, so it’s only fair that drivers pay expenses for resources they use. What can we learn from other transportation agencies? Minneapolis’ streets.mn reviewed its transit agency’s parking investments, and found that investing in Bus Rapid Transit served 7.5 times more users than investing in parking structures. I compiled parking space quantities from Metro’s website. Looking at Metro rail lines, as well as the BRT Orange and Silver Lines, Metro has a total of 19,450 parking spaces. Nearly twenty thousand spaces! That’s just on the rail and BRT lines, I am sure there are more parking spaces in Metro’s holdings. That’s just today, I expect that there’s more parking coming on line with Metro rail expansion under construction. Of those 19,450 Metro spaces, 18,048 are completely free. That’s 93% of the total. Metro only charges for 1402 spaces – more on that below. How much did this parking cost Metro to build? I did some back-of-the-napkin calculations. For surface parking, which varies based on real estate costs, I’ve used a conservative national estimate of $4,200 per space. For parking structures (the ones that I know of: Willow Blue Line Station, Sierra Madre Villa and Del Mar Gold Line Stations, and La Cienega Expo Line Station), I’ve estimated $27,000 per parking space, a Los Angeles estimate directly from Donald Shoup. Using these estimates, for Metro’s nearly 20,000 parking spaces, the total construction cost for Metro parking comes to about $150 million. That’s a conservative estimate, and the actual amount is likely higher. That’s a lot of transit money going to park a lot of automobiles. Metro can sell parking spaces for $3 for all day. This is the cost for Metro station parking at Park-by-phone.com. Some Metro lots should be able to charge more than this, some less, so it represents an average for purposes of my estimate. Metro can actually sell 25% of its spaces. I am assuming that three out of four spaces might be empty if Metro charges for them. Some popular lots will fill up; outlying lots that don’t fill today won’t fill in the foreseeable future. Metro should be able to keep occupancy higher by using pricing strategies, and should probably aim for Shoup’s 85% occupancy target, but, for purposes of a conservative estimate, I am assuming that Metro can fill at least one space in four system-wide. Metro’s parking spaces will only be sold once per day. In the real world, some spaces will turn over, so they could be charged for a few times each day. Metro can do this every weekday of the year – 260 days per year. These are fairly low assumptions. They’re certainly not my recommendations, nor a good business plan. I am using a one-size-fits-all formula, and parking pricing should vary based on demand. Desired locations at desired times should charge more than this. Even with these conservative assumptions, I estimate Metro’s potential parking revenue at just over $3.5 million per year. A proactive agency should be able to do significantly better than this. That number is for gross revenue, and there would be some costs to administer and enforce this program, so the net revenue is somewhat less, but it’s clearly a lot of money. Millions of dollars every year. But Metro already charges for parking! What about those 1402 spaces where Metro already charges for parking? 610 of them are at the Del Mar Gold Line Station, which is unique in the system, charging $2 per day. The remaining 792 non-free spaces are available by purchasing a monthly parking permit, which costs $20-$39. The permit guarantees the user a space when arriving before 10:30 a.m. After 10:30 a.m., all Metro parking spaces are free. When I write that these spaces are “available” by permit, that’s not quite true. 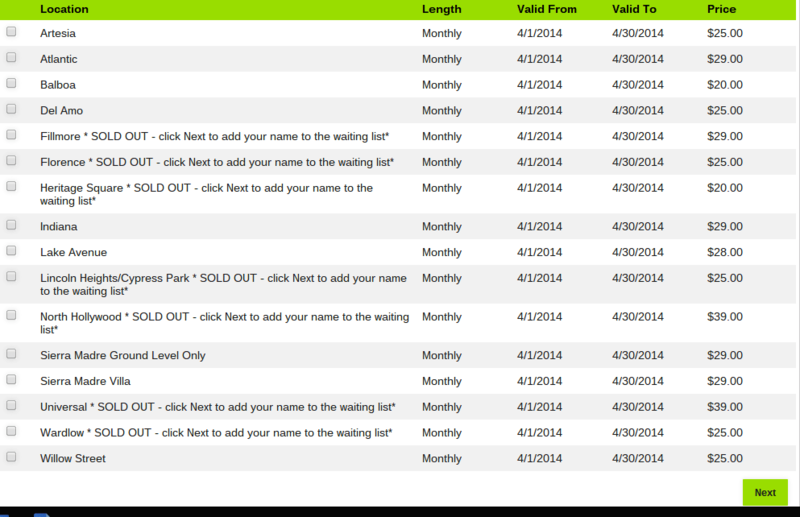 Of these 792 spaces, 534 spaces (67 percent) are listed as “sold out” on the Metro Parking Pass website. So many “sold out” locations mean that, for the small percentage of non-free spaces, Metro is selling them for less than their market value. To manage these spaces more efficiently (meaning Metro actually selling parking to people who want to purchase parking), Metro can either raise the price or increase the supply. In every lot listed as “sold out,” Metro can increase the supply by converting existing free spaces to permitted ones. I calculate that Metro grosses roughly $250,000-$350,000 per year from its monthly parking permit system. Some of these moneys would go into administering and enforcing the program. Assuming that monthly parking revenue is roughly $300,000 each year, and that this is the only revenue Metro is getting from these lots, then it will take nearly 500 years for Metro to recover its $150 million in parking construction costs. There’s also a Park-by-phone system that sells Metro spaces for $3 per day. It’s unclear to me how this fits into the Metro parking system. Is there another chunk of spaces, or re-selling permit spaces, or something else? I’ll look into this more in the future – or if someone out there knows, please tell us in the comments below. Charging for parking is prudent fiscal policy and good transportation policy. Changing Metro parking subsidies won’t happen overnight. Charges can be phased in over time, lot by lot, starting with the most popular sites, where drivers are already frustrated and cruising today. The parking revenue processes might get underway with a board motion directing Metro staff to report on parking revenue. What does it cost to build, operate, and maintain Metro’s parking? How is Metro’s monthly permit program working: how much revenue does it bring in, and how does the program respond to parking demand? Similarly, how about Metro’s Park-by-phone program: revenue, response to demand? What other parking does Metro own, in addition to the rail and BRT lots this article focuses on? Perhaps, as Metro sets its target for fare recovery for operations cost, it can also set a target for parking cost recovery, with phased-in deadlines for meeting targets. There are plenty of good reasons for Metro to charge for its parking: revenue, fairness, effectiveness, usefulness, environmental benefits, etc. Let’s look at just one more: charging for parking helps Metro track usage data. Data is needed to help Metro make accurate projections for where parking will be needed. If Metro gets a better handle on parking demand, then it can reign in excessive spending on parking in some locations, and dedicate limited funds to what’s most effective in providing transportation. Thanks for shining a bright spotlight on this issue. I would guess that part of the concern in raising prices for Metro lot parking would be from immediate-vicinity neighborhoods that would be concerned about spillover parking that would result from people choosing not to park in the once-free lots. However, that’s just more reason to do this in a coordinated fashion, with Metro working with local governments and neighborhoods to raise costs in Metro lots while also restricting nonresident parking just outside those lots. The back-of-the-napkin of $3.5M/year probably drops to no more than $3M when factoring in admin costs, which is a lot of money, but still Metro is staring down a $35M shortfall in two years. So, it would certainly be helpful, but, as you point out, it’s not nearly enough to cover what Metro is trying to accomplish by raising fares. Perhaps just getting the conversation going, however, could move Metro to explore more market-based parking pricing that could generate even more revenues and potentially stave off later fare increases for a period of time or allow Metro to increase fares by not as much for seniors, youth and disabled people who have fewer options in their transportation considerations. There’s likely already spillover parking from people who can’t find an open spot in the parking lot. Raising the price of parking slightly can’t make the problem any worse. The other interesting aspect of the BART motion you mentioned, is that the board voted to index fair increases to inflation. METRO needs to vote to make fare review a regular process so we can have this discussion once and avoid the political theater every few years. ” . . . spillover parking that would result from people choosing not to park in the once-free lots” — my first thought as well. Many stations are in high/higher density neighborhoods. Additional hypothesis: parking fees would disproportionately impact lower-income driver-riders. I’m not opposed, but concurrent fare increases are needed. Riding public trans in other major cities reminds me of how low our fares are. I agree, and recommended this in testimony at the Metro board’s fare hearing Saturday. It only seems fair to charge more for the parking portion of a transit trip than to put the entire increase on the transit fare. I’d also like to know more about daily charging. The Red Line’s North Hollywood parking lot doesn’t work for intermittent users: free spaces are full, paid spaces are available but paid monthly, and the only other choices are a few parking meters on the street or walk a number of blocks from parking in the surrounding neighborhood. The land around those stations is being squandered offering up millions in free parking. The fees from parking there should pay not just for parking maintenance but should subsidize the station overall and pay for other amenities like bathrooms, lockers, and small storefront business development. @traal:disqus mentioned it already – but there is a spillover problem already when “free” parking fills up by 7am. In addition, those same areas are already impacted by a “cruising for free parking” problem, too – more traffic, more pollution. (There also may a speeding to get to that last free spot problem, who knows.) My personal inclination is that a spillover problem is less of a problem than a less-affordable-fare problem. Is Mayor Garcetti a new mayor or more of the same? Does he believe in economic justice? Fighting climate change? A real liberal mayor would come out for right-priced parking at Metro. I suggest a letter campaign. I don’t think that parking fees could possibly disproportionately impact lower-income riders. Right now the fares of the 90+% of non-driver-riders are subsidizing the <10% driver-riders. I don't have a study or anything, but my hunch is that the folks who don't drive are lower income than the folks who drive. Excellent work. I don’t understand the logic of setting the price such that three out of four spaces were left empty however. I would think the logical proposal would be to follow Shoup’s advice, and charge just enough such that 85% of the spots are occupied at any given time. For some lots that might mean the price remains zero. For other lots, it would be $10 or even $20 as the system gets more popular. My only fear would be that it might encourage Metro to build more parking. In general, people who drive to Metro stations somewhat “defeat the purpose” of transit. A disproportionate amount of the pollution from driving is caused by the “cold start” and parking attracts increased car traffic in exactly the very places right around transit stations that should be as transit, bike and pedestrian friendly as possible. And who wants to live in a “transit-village” centered around a 2000 space parking garage? The fact that over 90% of people access Metro by a means other than private automobiles is actually a very good thing. I guess that includes bus and rail, but by way of comparison, up in the SF Bay Area, half of BART passengers arrive at the stations by private auto, leading some to sort of dismiss the whole BART system as an expensive glorified parking lot shuttle. I agree that Metro should start charging for parking, but if they do, don’t let them shift their priorities towards providing more parking around its stations than they already do. Definitely agree that Metro should manage toward 85% occupancy. I only did the 25% system-wide occupancy for purposes of getting a conservative estimate of how much minimum revenue Metro could expect. I didn’t want Metro to hire a consultant to say “Streetsblog says $10M, and our consultant says only $8M” so I low-balled it. Metro has lots (5,178 spaces on the Green Line, 2,869 spaces on the Silver Line) that include parking spaces that are likely to be difficult to fill at any price. With efficient management, they should be able to shatter my low expectations of 25%. True, and don’t forget, Metro should really be analyzing all of their surface lots for development potential. If they can make more money developing it than using it for parking, then they should develop it. This is a major point. The costs of parking lots are not just what it costs to pave and maintain them. The opportunity cost of this highly valuable land also has to be accounted for. Are there other uses for this land that would result in much higher return for Metro? Funds that could then be rolled back into providing the services they are in the business of offering and replace or increase the small amount of ridership that might be lost due to decreased parking at central city stations. Precisely. If they have large numbers of spaces that aren’t routinely used at $0.00 price, that means there is space available for residential/business development that would likely be a much more productive use of the land for Metro and the local area. There is a concern that parking fees especially at night and on weekends would discourage low income drivers because they come from areas where transit service is poor, especially at night and on weekends. Not charging for parking after 11 am or so, as is the current Metro reserved parking program, is fair. People coming in before 11 am are generally coming back during peak hours where transit service back to neighborhoods is available. BART charges for parking until 3 pm but in practice the security guards make their rounds well before that time. The other concern is that neighborhoods will end up becoming park and rides. As part of the free UC Berkeley Class Pass program, I knew several individuals who parked on side streets in West Berkeley and North Oakland and took the bus in. They were commuting from Contra Costa County or inland Alameda County and parking on streets adjacent to major bus routes. I’ll do that myself when I leave work to go Downtown for evening activities by parking next to a route on the 15 minute map, instead of backtracking to a Gold Line station park and ride. If it is spread out it is not noticeable, but too many (like on Grand Avenue next to the 498 stops in Covina) and it becomes a problem. SO.CA.TA likely would support parking fees to assist the operations budget. And I am sure the Metro Board members would welcome something practical to provide revenue to make it possible to trim the fare increase proposal. Plus this is just good policy! Metro is squandering revenue with their PATHETIC lack of fare collection at light-rail stations that are either UNLATCHED (STILL! ), or not enforced AT the fare-gates! PLUS, their farebox collection rate is abysmal, considering there are probably MORE fareboxes on MTA boxes in any given day that DO NOT WORK, vs. DO (how many millions ARE you trying to lose MTA?). This does not include excessive administrative/executive salaries (when the CEO of the MTA makes MORE THEN A COUNTY SUPERVISOR, AND MORE THE THE CA GOVERNOR, THAT IS A MAJOR FISCAL SQUANDERING!). You would think the MTA would be more tight-fisted, and money-grubbing, but they are not! God forbid, THAT level of fiscal competence should emerge! Experts disagree with you: “Driving is too cheap”. I’ve been baffled for years why the Universal City/Studio City Red Line lot is free. Metro knows people use it as “free” parking for Universal Studios – they have signs all over the place saying the lot isn’t for Universal Studios parking. Considering the cost, I can’t imagine they have an employee monitoring every space/car all of the time to make sure the associated car owner doesn’t wander off someplace else that’s not Metro. It costs Metro more than 180 million dollars to build free parking for you (and other driver riders). I think it’s more fair if you help pay for your share of this, and not have transit riders subsidizing your parking. A little noted aspect of the proposal is to do just that after this current change has been implemented. If you stop using the park and ride and drive to downtown, then someone else will pay for the spot that you free up. And is there really daily parking in downtown for $6?! Meters charge $4 an hour! I’ve never seen a bus whose farebox is not working. If the number of full spots currently is 95%, and the number after the pricing is 85%, then at most 10% of the size of the lot would be increased spillover. However, this is probably an overestimate, because some current spillover probably results from people hoping for free lot parking and then being stuck searching in the neighborhood – if there is a known price and known availability, then some of those people will just choose not to hunt in the neighborhood and will take bus or bike in to the transit center. They exist! Trust me. Look for the fareboxes that have the “bill insert” part BLOCKED (due to it NOT TAKING DOLLAR BILLS!). Why the MTA picked this model of farebox is beyond logic! Then again, so is the MTA! I once complained to the Metro bigwig who oversaw purchase of the boxes about how lousy they are (for example coins have to be dropped into the slot one at a time or they get jammed, which slows down boarding). She claimed “Buy American” federal requirements meant they had no alternative. I found that rather far-fetched, as I have rode other systems with far better fare boxes that surely had to comply with the same requirement. This is the same person who oversaw the TAP program which is now widely acknowledged as a fiasco of massive proportions. Eventually she was quietly allowed to retire despite the obvious mis-management and vast waste of funds on her watch. UGH! If it makes sense, is efficient, or PRO-BUS RIDER, it is NOT DONE! OCTA, San Diego’s MTS, and the Inland Empire bus systems have the SAME TYPE OF BUSES, yet different fare boxes that ACTUALLY WORK! Those transit agencies also are INDEPENDENT, and not “married” to the county’s “transportation commission”, and thus, are more efficient as well! Actually OCTA is the Transportation Commission for Orange County. And I don’t see how having a Commission separate from an operating agency ipso facto leads to more efficient operations. But if you feel otherwise go to Sacramento and begin lobbying for legislation because Metro was created by the merger of the RTD and LACTC (AB 152). That is how to divorce operations from planning, funding, etc. The commuter express (not Metro, but this is still relevant), use the old, simple style boxes to collect fare where it’s just an open box with another box below that has a latch the driver opens to let the money from the top box drop into the bottom locked box. The TAP readers however stop working from time to time. So on the Commuter Express, it’s the people that use TAP that sometimes get to ride for free, not the ppl that pay w/ cash. It’s also telling how drivers really only look at the per-trip cost. Add in gas, vehicle depreciation, insurance, etc. – and it’s well over $6 – and that doesn’t count external costs – building and maintaining roads and highways, wars for oil, etc. We as a society have invested so much in making sure drivers don’t individually pay the high cost of driving… and those drivers just don’t appreciate it! @Marcotico Agreed, and Metro should do the same with parking costs. If you park at a Metro lot, and then ride the train/bus, the parking cost is essentially part of your fare. When someone’s monthly transit costs begins to rise, they’ll consider options to lower it (riding a bicycle to the station, carpooling…). And if the parking/fare costs are indexed to inflation, and balance each other out, the supplementary revenue from parking will make for a less impacting fare increase when it does happen.